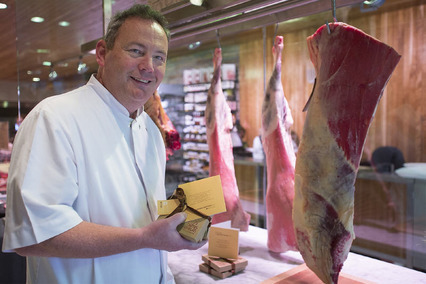 Last week I was chatting to Pat Whelan, who is one of Ireland's most renowned butchers with stores in Clonmel, Co. Tipperary and Avoca Foodhall in Monkstown, Co. Dublin. He's always looking for new and innovative ideas to promote meat and he's come up with an absolute beauty for Christmas (here comes the science bit...). Pat has launched what he claims are the world’s first ‘Beef Bonds’, giving investors an alternative to financial markets. The Beef Bond is a boxed certificate giving a share in one of Whelan’s Angus, Hereford or Wagyu/Kobe cattle. Each bond displays the ID number, breed and expected maturity of the animal it is linked to. An “investor” who buys one, or multiple share certificates, gets delivery of a box of various cuts of prime Tipperary beef on maturity. The maturing weight of the animal is predicted at the time of purchase, guaranteeing the buyer a yield. However if the animal exceeds its predicted target, then the bond holder is in for an extra windfall of meat. The bonds generally mature within 10 to 12 weeks of purchase, but shorter term bonds are available on request. The ideal Christmas gift for family or for corporate clients, Bonds in Angus and Hereford cattle are €100 each, while bonds for the more exclusive Wagyu/Kobe Bond start at €150. If you're thinking of what to buy me for Christmas as a small token of your appreciation, I'd love a bond!